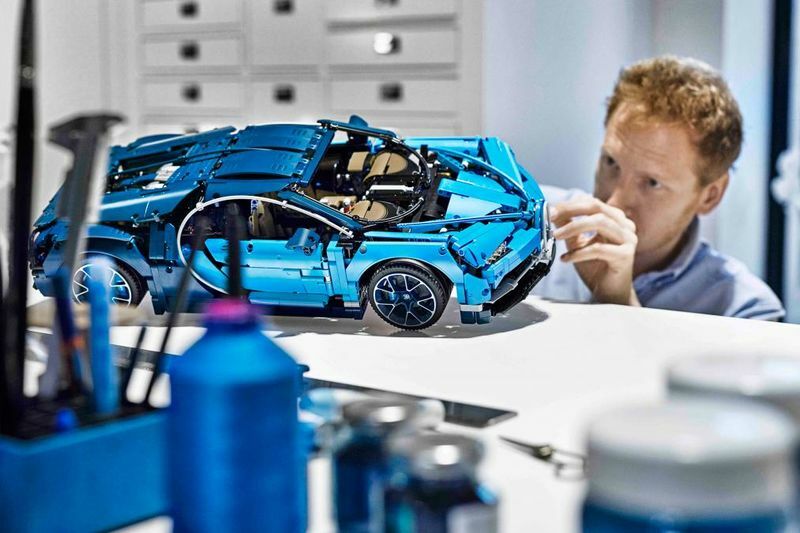 Home / Automotive / News / Bugatti Chiron Lego Kit Launches... With 3,599 Parts! Is it Christmas time yet? No? . .. Well, my birthday then? This incredible model supercar features an active rear wing, speed key and moving pistons in its W16 engine. The Bugatti Chiron is the latest car to get the LEGO treatment, following the launch of the new LEGO Technic Chiron. The LEGO Chiron is the brand’s new Technic flagship, taking the crown from the LEGO Porsche 911 GT3 RS, which launched in 2016. But, while the LEGO GT3 RS has 2,700 pieces, the new Chiron trumps that with 3,599 individual parts. All of these are existing LEGO components, save for the unique wheels, which closely mirror those of the real car. The LEGO Chrion’s designers recreated several other key elements from the Bugatti Chiron when designing their latest model. It, like the real car, features a ‘speed key’: in the real Chiron, this increases the car’s top speed from 236 to 261mph, while in the LEGO Chiron it raises the active rear spoiler. Another aspect of the LEGO Chiron that draws on the real-life car is its W16-cylinder engine, complete with moving pistons. And while the LEGO Chiron gets a working gearbox with steering-wheel-mounted shift paddles, owners of the model will actually have an extra ratio, as real-world Chiron owners make do with a seven-speed dual-clutch transmission. Finished in Bugatti’s signature two-tone blue-on-blue, and measuring 56cm long, 25cm wide and 14cm high, the one-eighth-scale LEGO Chiron also features a bespoke overnight bag, stored in its front boot. Secreted under the hood is a unique serial number, which owners can use to unlock hidden content on LEGO’s online Technic site. Launching the LEGO Chiron, Bugatti’s president, Stephan Winkelmann, said he was “impressed at the precision and refinement with which our super sports car has been translated into the LEGO world". The real Bugatti Chiron is powered by a W16-cylinder 8.0-litre quad-turbo engine, producing 1,479bhp and returning 12.6mpg. It has 10 radiators, takes 2.5 seconds to go from 0-100km/h, and can drain its 100-litre fuel tank in nine minutes at full chat. The Bugatti Chiron is priced at around £2.5 million, with production limited to 500 models. LEGO’s Chiron is priced at around R6,500, and is available to buy at LEGO’s retail and online stores now, before going out to other shops on 1 August.